We’ve already heard which 2017 movies had the best producing, directing, and acting (at least according to the producers, directors, and actors), which only leaves the most important group in all of content creation: the writers. Without those wizards of the written word, all movies and TV shows would simply be formless waves of static, telling no new stories and enriching very few lives. So, tonight’s Writers Guild Awards ceremony is less about Hollywood patting itself on the back for a job well done and more about Hollywood paying tribute to the only gods who truly matter. Also, the WGA Awards are the final big ceremony like this before the Oscars, so they are fairly important. 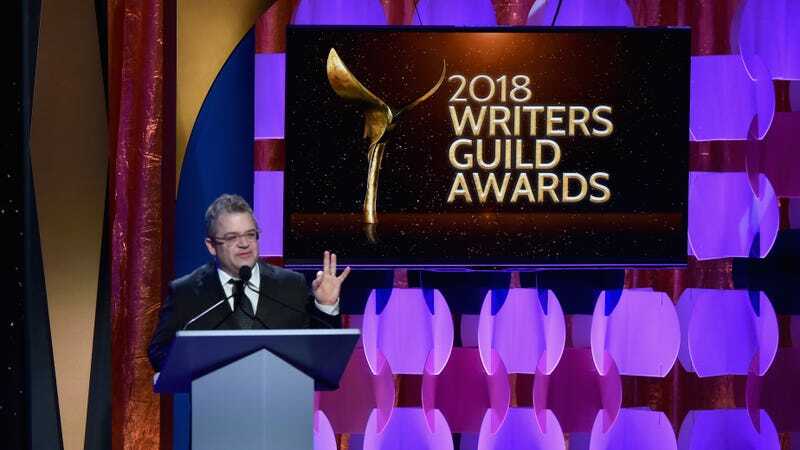 As for the awards, the Writers Guild Association paid tribute to a lot of dependable award-deservers like The Handmaid’s Tale (which also won Best New Series), Better Call Saul, Veep, and BoJack Horseman. Saturday Night Live won for the sketch comedy/variety category, further encouraging the show to continue making easy Trump jokes every week, and Flint beat out some tough competition in the long form original category to win Lifetime a WGA award. Call Me By Your Name won the Best Adapted Screenplay award, the only award almost as prestigious as Best Original Screenplay, which went to Get Out. That should be a very good sign for the movie’s Oscar chances, as its good showing at the Directors Guild Awards teased a showdown between it and The Shape Of Water next month at the Academy Awards. The major winners are below, and the full list can be found at Variety.